Sebastian Soto has had quite a year. 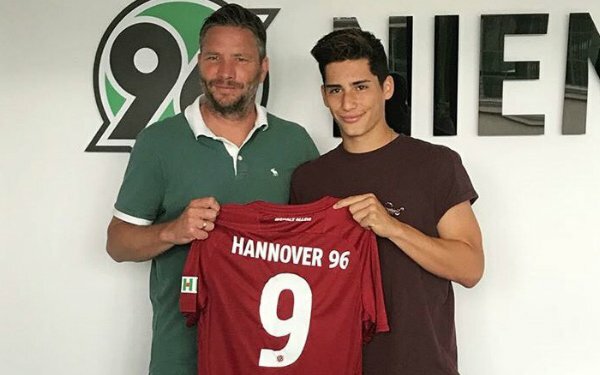 After a breakout performance in the Development Academy with Real Salt Lake, he signed with Hannover 96 where he has scored at a rapid pace for the club’s U-19 team. Now he’s on the U.S. U-20 team that has already qualified for the World Cup and is pushing for its second straight Concacaf title. Soto, 18, was on the field for the U.S. team’s decisive 4-0 victory over Costa Rica on Friday that clinched qualification. As one of three players added to the team after the group stage, Soto earned the start and while he did not score, the win was one of the best moments in his young career. The U.S. team will take on Honduras on Monday night and a win or draw would clinch a spot in Wednesday’s final – likely against Mexico. Soto is the son of a Chilean-American father and a Mexican-American mother. He has never played in a high-profile USA-Mexico game before and the opportunity to take on El Tri is something that he wants. Playing for the U.S. U-20 team means a lot for Soto but he only broke into the team over the summer after he won the Golden Boot for the U.S. U-19 team at the Slovakia Cup with five goals in four games en route to a third-place finish. That tournament came on the heels of a staggering season with Real Salt Lake’s U-19 team in the Development Academy where he led all scorers with 45 goals in 27 appearances. “The transition was really, really smooth,” Soto said of moving to Germany. “I have nothing but positive things to say about Hannover. They realize that, as a striker, if you're not happy, you won't perform that well. I didn't even have to say anything. They made me feel at home and made me feel like family. Ultimately, they make you work hard. I love the whole environment and because of that I've been thriving immediately. U.S U-20 teammate Chris Richards has seen Soto’s talent both with the national team as well as in Germany where he plays for Bayern Munich’s U-19 team while on loan from FC Dallas. With the United States having already booked its ticket for the U-20 World Cup next May in Poland, Richards believes Soto will be a big part of the equation there. Soto’s rise in this year is another success story for young American players who are making the move to Germany to continue their careers. It is also brings to the forefront the issue of MLS academies that have played a very important role in developing some key American players but have seen them leave for Europe without any transfer fee or training compensation. Weston McKennie was the first prominent example, but others have followed. Real Salt Lake played a big role in Soto’s development when it scouted him as a young teenager and moved him from Southern California to Arizona to play with the academy. It was there he worked with the club’s academy director and former U.S. national team assistant coach Martin Vazquez to convert him from a winger to a central forward. Despite his weak frame at the time, Soto learned the position quickly and saw his development blossom. Because of that, leaving Real Salt Lake was especially tough. “It was really tough,” Soto explained. “Real Salt Lake made me the striker I am, so I am always going to be grateful for them. It was not easy but I guess the only thing that made it easy was that as a kid, I always dreamed of playing in Europe. Real Salt Lake, at the end of the day, I think they know that. For now, however, Soto is looking to use his strong 2018 to set up an even stronger 2019 – which he hopes will include his Bundesliga debut and a long run with the U.S. U-20 team at the World Cup. He doesn’t, however, take for granted he will make the World Cup team. There is plenty of competition, and there is always the possibility that Josh Sargent and Tim Weah could play for the team. But even without the top age-eligible players for this U-20 team that are instead playing on the full national team, Soto believes the team can go a long way in Poland, perhaps beyond the quarterfinals – which is where the team finished at the last two World Cups in 2015 and 2017. “We joke about it. We're like: 'we're really good,'” Soto said. “We think this U-20 team can go far because of our quality, our mentality, and teamwork. I know we haven't been able to show it because we haven't had a lot of time this cycle. It's been short. But over such little time, we're already showing this much chemistry.